I spent Tuesday morning recovering from my visit to the Museum of the Weird and a Smashing Pumpkins concert, and while a healthy breakfast probably would have done my body good, I decided to go with a sugar rush instead. Voodoo Doughnuts was a block away from my hotel, and I'd been meaning to try it for a while. Keeping with the theme of weirdness, I decided it was time. The shop doesn't look much when you first walk in. Just your standard donut place. It's not until you look into the rotating pastry case that things start to get really fun. As soon as I spotted those cereal donuts, I knew I was going to make some very poor dietary choices. 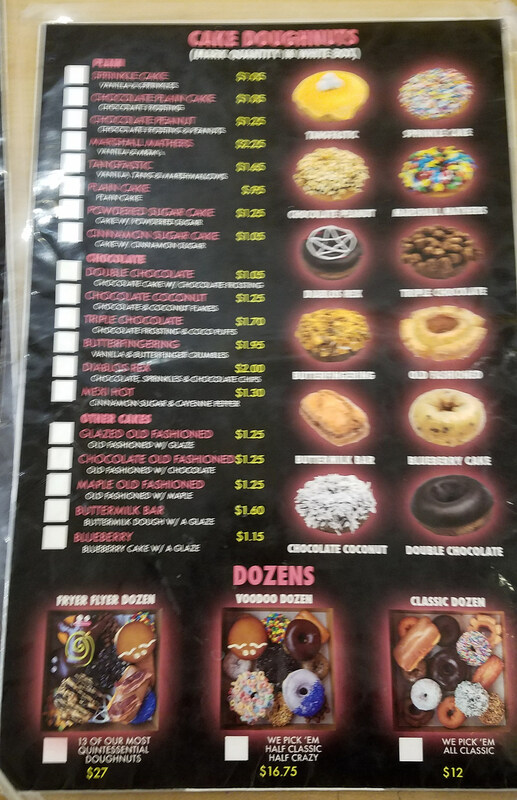 I took a couple of quick pictures of the menu. One is blurry, so apologies for that. They're both also a little NSFW, so I'm just going to provide links to them below. When you see the tray below, don't judge me too harshly. I had a friend with me, and we split this. I didn't eat the entire order myself. I'm pretty sure I'd be dead of a sugar overdose if I had! Speaking of dead, it took a few sips of coffee until I was awake enough to realize our table was covered in celebrity obituaries. But the decor wasn't entirely morbid. The donut tree was appetizing! 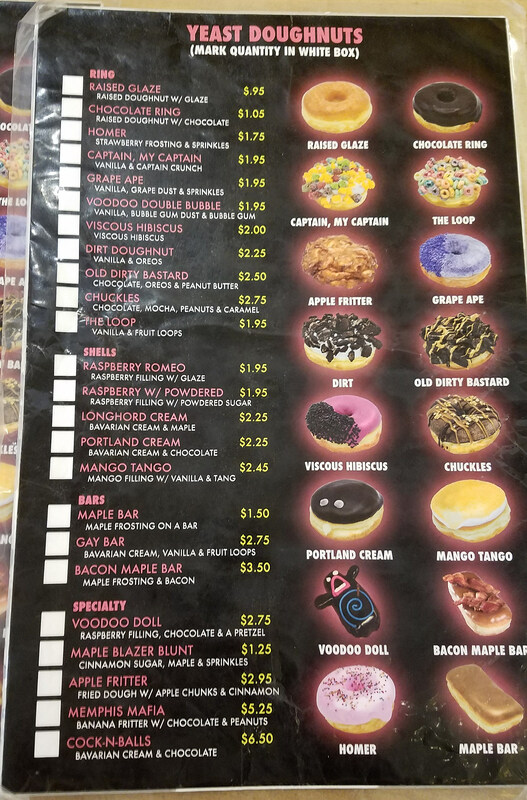 So if you're ever on 6th Street and looking for a unique breakfast to soak up all the booze, stop by Voodoo Doughnut and test your might.